A forgotten Bible, a medical emergency in the audience, and a case of the sniffles couldn’t keep Iowa Gov. Terry E. Branstad from making history today at the Community Choice Credit Union Convention Center in Des Moines. With a joint session of the General Assembly, the department heads of the Executive Branch, and all of Iowa’s statewide elected officials on hand, he delivered his seventh inaugural address after taking the oath of office to serve his sixth non-consecutive term as Governor of Iowa. 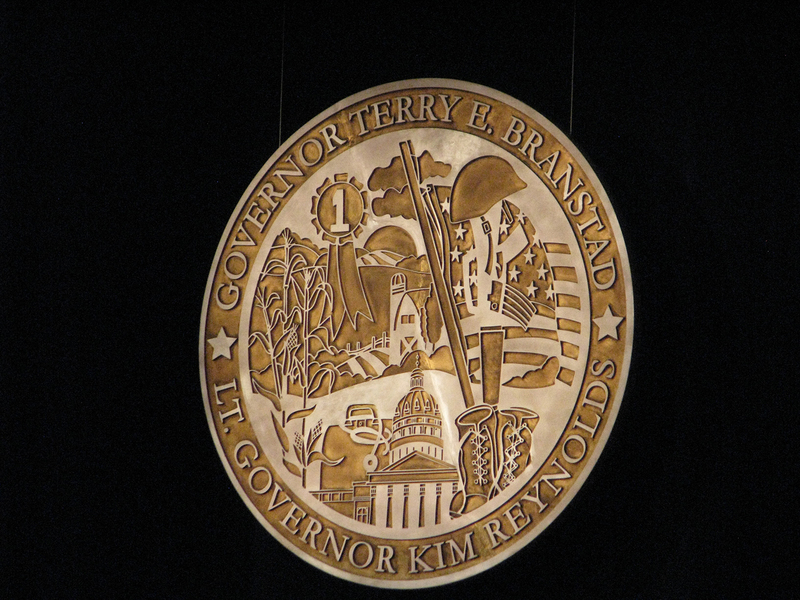 Branstad was inaugurated once as Lt. Governor before he was elected Governor. Gov. Terry Branstad addressed Iowa’s need to improve its infrastructure during his Inaugural Address on Friday. 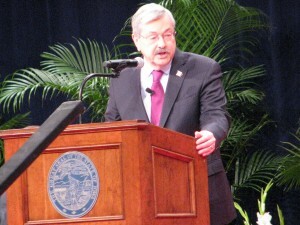 Branstad opened his speech with a number of Iowa’s successes during the past four years of his administration. He then followed with a series of new challenges for the state government to tackle. Most of those focused on meeting the state’s infrastructure needs. Branstad said Iowa’s future is what Iowans want it to be, and what they make of it. Branstad was preceded by Lt. Gov. 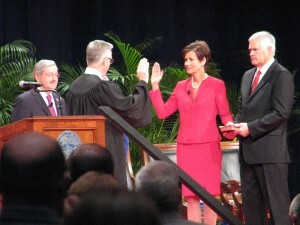 Kim Reynolds, who delivered her inaugural address after taking the oath of office to serve her second term as Lt. Governor of Iowa. Both oaths were administered by Iowa Supreme Court Chief Justice Mark Cady. Lt. Gov. Kim Reynolds took her second oath of office Friday at Community Choice Credit Union Convention Center in Des Moines. Reynolds focused her speech on science, technology, engineering, and mathematics training efforts in Iowa, as well as the need for meeting the future challenges Iowa will face. She also said improving Iowa’s business climate must remain a priority to create an environment in which entrepreneurial risk is rewarded, and “the next million-dollar idea” isn’t smothered by rules and regulation. Moments before the oath of office was to be administered, one of the singers taking the stage quietly approached Branstad and handed him the Bible that was to be used during his swearing in. The Bible had been momentarily misplaced, but was quickly delivered via attentive staff members. Midway through Reynolds’ speech, a member of the audience suffered a medical problem. A pair of state troopers quickly assisted the audience member, who was able to get prompt medical attention while nearly everyone else in the room was unaware of the situation. The audience member was transported by ambulance to a Des Moines hospital. Immediately after being sworn in to his historic sixth term as Governor of Iowa, Branstad paused to wipe his nose with a handkerchief. As he spoke, his voice belied the fact he was a little bit under the weather. New Jersey Gov. Chris Christie, a potential 2016 GOP presidential candidate, was on hand for his friend’s inauguration. He entered with almost no fanfare whatsoever, flanked by a pair of security guards, during a musical interlude between announced entries of Iowa dignitaries. Freshman U.S. Sen. Joni Ernst was a very popular figure during the gathering prior to the start of ceremonies. She stood at the back of the ballroom with U.S. Sen. Chuck Grassley, which eventually turned into an impromptu greeting line. For more photos from the inauguration ceremony, click here.